Gough lies 350 kms (220 miles) SSE of Tristan da Cunha. It is uninhabited, but hosts a South African Meteorological Station, and is a UNESCO World Heritage Site. Gough is the second largest of the Tristan da Cunha Islands Island Group and lies 350 kms or 220 miles SSE of Tristan da Cunha. Gough is 13km long and 5km across at its widest points and has an area of 65 sq km. Gough is a complex volcanic island about 5m years old with eruptions up to 100,000 years ago on its summit of Edinburgh Peak. Gough was discovered by the Portuguese Captain Gonçalo Álvares Alvares probably in 1505 and was originally named after him, being corrupted into the name 'Diego Alvarez' later. In 1731 Captain Charles Gough discovered what was then thought another island and this was named 'Gough Island'. 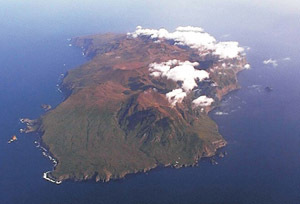 Soon it was known that Diego Alvarez and Gough were the same, and that the earlier name should take precedence, nevertheless the name 'Gough Island' remains, but this is often disputed. Gough was visited by sealers and whalers in the 19th century when stocks were severely depleted. Short scientific expeditions took place in 1904, 1922 and 1933 which established Gough as a site of great botanical, ornithological and geological interest. The Gough Island Scientific Survey (GISS) of 1955/56 was the first comprehensive scientific study of the island and included the first detailed map. Their base at The Glen offered the only reliable access inland. The GISS left Gough in May 1956 on the South Africa Naval Frigate Transvaal which also brought a South African Meteorological Team which took over the GISS base at The Glen and first establish what has been a continuous scientific presence on the island. The first team consisted of four members including Johannes Van der Merwe who was meteorologist on the GISS team. The second team included Tristan Islanders Albert Glass and Lindsay Repetto. 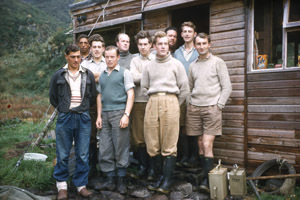 Photo of the GISS team including Leader John Heaney, Tristan Association President and Chairman Michael Swales and Association Vice President Sir Martin Holdgate, together with their Tristan guides Ernest Repetto and Harold Green outside the expedition hut at The Glen in 1956. The weather station was moved from the original site at The Glen to its current position on a plateau above Transvaal Bay in 1963. 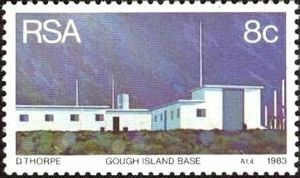 The station on Gough Island is usually manned by a team including a senior and two assistant meteorologists, a medical orderly, a radio technician, a diesel mechanic and various field assistants/biologists. The land the station is built on is leased by the UK Government to the South African Government. The station is managed as part of the South African National Antarctic Programme (SANAP) which also organises their bases on Marion Island and Antarctica. 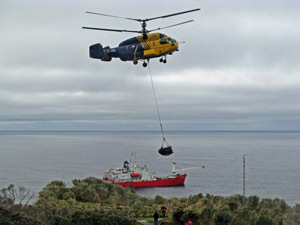 As part of the lease agreement a SANAP vessel, as well as transporting teams and equipment to and from Gough Island from Cape Town, also calls at Tristan da Cunha on the outward and inward journeys, providing berths for about 30 passengers and freight transit. An annual inspection of the base, to ensure strict environmental conditions are adhered to, is carried out by the Tristan Government. 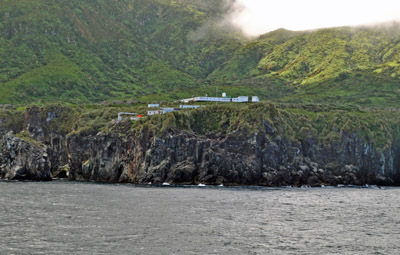 Gough Island became a World Heritage Site in 1995 and the site was extended to become the Gough and Inaccessible Island World Heritage Site in 2004. On the UNESCO Website Gough Island is described as the least-disturbed major cool temperate island ecosystem in the South Atlantic, and one of the most important seabird colonies in the world. The island is scenically beautiful with spectacular sea cliffs round much of the coastline. Two endemic land birds are found: the Gough moorhen and the Gough finch. 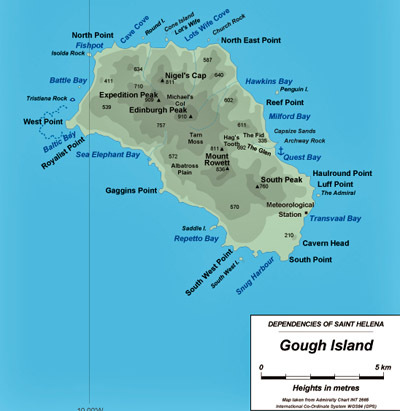 Gough is in the Tristan da Cunha Priority One Endemic Bird Area, as defined by BirdLife International. Its undisturbed nature makes it particularly valuable for biological research, which, with weather monitoring, is the only other activity permitted on the island. 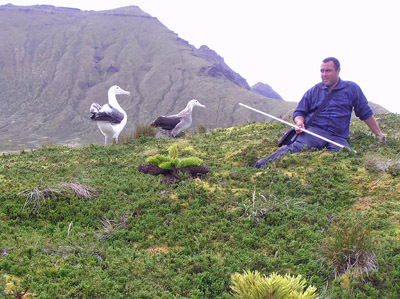 The Tristan Conservation Department is active in monitoring wildlife on Gough Island - photo above shows Simon Glass with a pair of breeding Tristan Albatross on Gough Island.